Jason Demetriou of Southend United scores past Jonathan Bond of Peterborough United from the penalty spot. Photo: Joe Dent/theposh.com. Peterborough United missed a great chance to close the gap on the League One promotion favourites by losing at home to a Southend side with a terrible away record. A seventh-minute penalty from Jason Demetriou separated the sides as Posh suffered a sixth home defeat of a frustrating season. It was just Southend’s third win on their travels, and a first since October. Posh striker Jack Marriott takes on Michael Turner of Southend. Photo: Joe Dent/theposh.com. 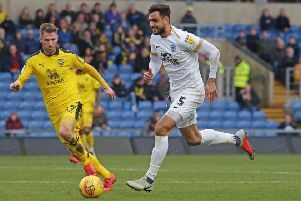 Posh huffed and puffed, but in truth created very little despite starting with an adventurous formation which included new striker Omar Bogle. Referee Dean Whitestone was booed off at the end by home supporters, but his curious display was hardly the reason for the defeat. The penalty decision looked spot on for a start. Posh pleased traditionalists at least by starting with a 4-4-2 formation including two atacking winger as well as Bogle, but they spent the opening 20 minutes all at sea against a confident visiting side. Southend found joy down the left as Ben Coker’s surging runs from full-back often went untracked by Marcus Maddison, but the seventh minute goal arrived from the other flank as a simple pass into the area led to an initially hesitant Jonathan Bond tripping up Stephen McLaughlin. Posh debutant Omar Bogle in action against Southend. Photo: Joe Dent/theposh.com. Demetriou converted the spot-kick and Posh did well to survive a rocky period while they worked themselves into the game. And once Maddison started getting on the ball Posh began to threaten. One fine pass was superbly converted by left-back Andrew Hughes, but celebrations were ruined by an offside flag. Jack Marriott forced a smothering save from Southend keeper Mark Oxley after another Maddison pass. Marriott had earlier headed a fine cross from George Cooper straight at Oxley. Southend should have been down to 10 before the break after Dru Yearwood clattered into Anthony Grant just moments after he somehow escaped a caution for hauling down Hughes as he was about to enter the penalty area. Posh had an immediate chance to draw level when a long clearance from Maddison found Marriott behind the Southend defence. Marriott went for power and his shot was saved by Oxley. Posh then forced three coners in quick succession, all of which were delivered into dangerous areas, but then it all fell horribly flat. Posh made substitutions that made little sense (Junior Morias played in midfield for 10 minutes) and they couldn’t re-gather any momentum, not helped by a series of baffling decisions from the officials. Even 10 minutes off added time couldn’t save Posh. Hughes scored again from a Maddison chip, but he looked well offside, a decision contested by McCann, presumably after taking on board video evidence. Posh: Jonathan Bond, Liam Shephard, Andrew Hughes, Steven Taylor, Ryan Tafazolli, Anthony Grant, Chris Forrester (sub Junior Morias, 71 mins), Marcus Maddison, George Cooper (sub Danny Lloyd, 71 mins), Jack Marriott, Omar Bogle (sub Leo Da Silva Lopes, 80 mins). Unused substitutes: Conor O’Malley, Joe Ward, Jack Baldwin, Jermaine Anderson. Southend: Mark Oxley, Jason Demetriou, John White (sub Anton Ferdinand, 53 mins), Michael Turner, Ben Coker, Stephen McLaughlin, Dru Yearwood, Michael Timlin, Michael Kightly, Simon Cox, Marc-Antoine Fortune (sub Freddie Ladapo, 75 mins). Unused substitutes: Nathan Bishop, Harry Kyprianou, Jermaine McGlashan, Michael Klass, Shayon Harrison. Goals: Southend - Demetriou (7 mins, pen). Cautions: Posh - Bond (foul), Tafazolli (foul), Shephard (foul).